Den gamle byen Pompeii og øya Capri er to av de mest besøkte severdighetene langs Italias Sorrentinske halvøy, og en privat tur lar deg utforske i ditt eget tempo. 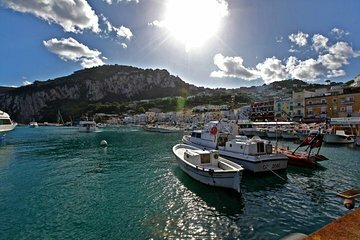 Oppdag UNESCO-listede ruiner av Pompeii på en morgenvandring, sett deretter seil for Capri og nyt et valgfritt cruise til den berømte Blue Grotto. Este passeio é imperdível. O Paolo, nosso motorista, além de habilidoso é muito solícito e agradável. Faz a experiência ser ainda mais fantástica. Naples was a port of call during our recent cruise. The pre-tour service was excellent, receiving a text the day before the tour, confirming pick up details, who our driver and guide were and contact numbers for both. Our guide was Paolo, an archaeologist by profession, so there was no better way to learn about Pompeii. His knowledge and enthusiasm was truly engaging, he didn't just point at things and read off a script but got us involved, turning us in to would-be archaeologists. Being a small group meant we could also avoid the crowds and long queues for main points of interest across the site. The afternoon was spent in Capri, going to the more quieter part of Anacapri. We could have spent the afternoon waiting in a line to visit the Blue Lagoon, but after a good lunch in a restaurant away from the main tourist traps, we made better use of out time exploring the island and capturing some amazing scenery, with Paolo catering for the different interests of the group and ensuring we got back to the port on time. Overall, a highly recommended tour and probably the best of all the tours we went on during our cruise. It was made all the better with an excellent guide.